If you’re looking for a hardwood alternative that’s easy on your budget but still looks good, then luxury vinyl or laminate are great choices. These two materials are often confused with one another. However, they have some important differences that you should know before making your decision. What’s the Difference Between Laminate and Vinyl Flooring? Laminate is made of 99% wood byproducts. It’s also called composite, Pergo (which is a specific brand of flooring), or floating wood tile. It’s composed of several layers of rigid, high-density fiberboards that are laminated together into planks. The photographic image under the resin layer depicts the material you want, which is usually stone or wood. It often floats, which means it can snap and click over an existing floor without being nailed or glued down. It can also be glued to a subfloor. Luxury Vinyl Plank (LVP)– These long planks can mimic the look of traditional hardwood floors. They can float, be glued down, or snap together. LVP can also be smooth or textured to mimic different types of materials. Luxury Vinyl Tile (LVT)– These attractive tiles come in a greater variety of lengths and widths compared to LVP. Therefore, it’s better suited for imitating materials like stone, granite, and concrete. However, they can also be made into wood-like tiles and rectangles. LVT can float, peel-and-stick, be glued down, or snap together for easy installation. Which Faux Wood is Better? Though they’re similar in appearance, radiant heating, and installation, Luxury Vinyl has a slight advantage in most of the other categories. However, both materials are excellent choices for any homeowner looking for an affordable floor that’s made to handle high traffic and the messes of life. When it comes to looks, which one will suit your needs? The photographic layer can depict many materials. Advances in manufacturing allow more detailed textures besides just smooth and shiny, departing from its “plastic” look of yesteryear. It still looks a bit synthetic compared to natural materials. The photographic layer can depict many materials to suit your room’s design. Manufacturing techniques have advanced for this material as well, allowing more textures besides a smooth laminated top layer. Though it comes close to looking like wood, its synthetic nature makes it appear slightly artificial. The Best in Looks: Tie! Though both allow you to save money compared to buying natural wood or stone, one has the definitive edge in savings. For more information, consult our flooring installation cost guide. Which material is easier to clean? This material is generally smooth and 100% waterproof, making spills easy to clean without giving dust a place to hide. Cleaning them requires a light vacuum, consistent sweeping, and the occasional deep clean with cleaners that can cost around $20 per gallon. Homeowners who pick a textured style should expect to have a tougher time getting dust and food particles out of the grooves. Since it’s smooth on the surface, spills are easy to clean. It also won’t trap dust and dirt easily. Cleanup is easy, requiring regular vacuuming, sweeping, and a little TLC with material-specific cleaners. A typical cleaning product costs around $20 per gallon, or $8 for a 32-oz. spray bottle. Homeowners who pick textured styles should expect to put more effort into removing dust and food particles from the grooves. Which floors are good for our four-legged companions? Since LVP is 100% waterproof, house training puppies or kittens aren’t as stressful. Scratch-resistant surfaces make pet nail damage nothing to worry about. Pet hair and dander can easily be swept or vacuumed away. Though it stands up well against pets, urine should still be cleaned up quickly since it isn’t impervious to smells. The top layer can be water and scratch-resistant when properly installed, making it tough against surface messes and nail scratches. Pet hair and dander is easily cleaned off its smooth surface. Since it isn’t waterproof, homeowners should house train their puppies and kittens before installing it. Pet urine can seep into any unsealed cracks and cause a lasting smell or even cause moisture damage to the fiberboard. Which one is more convenient to install for both DIY homeowners and contractors? Floating floors: Vinyl can easily install over an existing floor without nails or glue. An underlayment can help reduce noise and keep this floor warmer in cold weather. The click-and-lock feature makes seams tight and sturdy. Peel and stick tiles: LVT can stick directly onto a smooth surface. Glue-able: You can also choose to install LVT or LVP over a subfloor and secure them with glue. Laminate– As you will see, this material is just as versatile as LVT or LVP, with some slight differences in the installation process. Floating floors: Laminate can snap and click over an existing floor without being nailed or glued down. Use a foam underlayment, which can come already attached to the product, for added insulation and noise control. It also requires a vapor barrier to protect its fiberboards from moisture. Peel and stick tiles: It can come in tiles that stick directly onto a smooth surface. Glue-able: You can also choose to install this material over a subfloor and secure it with glue. The winner for easiest to lay down: Tie! When you make an investment in your property, you want it to last. Which of these will stand the test of time? This material usually comes with a 15+ year warranty. Homeowners can also extend its life by applying layers of urethane to reinforce the wear layer upon installation. Though good quality options can last up to 20 years, others typically last about a decade. Laminate generally doesn’t take on extra varnishes or protective coatings, so its original wear layer is usually its first and only line of defense. When it comes to water and moisture-prone rooms, which material is better? 100% plastic means that it’s waterproof. It can even be submerged and still be usable. Though it’s quite water-resistant from the top, its bottom layers are made of fiberboard which can absorb water if there is any flooding. It’s just a matter of time until you’ll need to do some repairs. Which product is easier to fix? Holds up for years with regular sweeping and manufacturer’s cleaners. It can’t be sanded down and refinished if it develops too many deep scratches and nicks. Instead, entire planks or tiles must be removed and replaced. Thrives with regular sweeping and manufacturer’s cleaning products. Top layer should not be exposed to standing water and extreme impacts which can shorten its life. The wear layer must be replaced since it can’t be refinished. Most Convenient to Repair: Tie! It’s becoming more important than ever to consider the impact we have on the environment, including our floors. LVP and LVT emit little to no volatile organic compounds (VOCs). It also lasts for many years, which means there is less turnover and waste for replacement. Though its plastic (PVC) is recyclable, there are few facilities that can recycle its type of plastic (#3) safely. Check with your local facilities to see if they can take old, vinyl floors. If they can’t, try contacting Armstrong Flooring’s On&On LVT/LVP recycling program. It’s predominantly made of wood, which makes an overwhelming majority of these products (85%) recyclable. You can even find brands, such as Mohawk, that make these floors from recycled materials. This material is known to emit VOCs, especially when the manufacturing is of lower quality. Homeowners must take care to check the Floorscore® of the product to ensure minimal off-gassing after installation. Heat applied directly to floor panels and the wall keeps properties warm even in the coldest of climates. Which material is good for this kind of system? Luxury Vinyl– LVP and LVT are excellent at conducting heat, especially when paired with a “self-leveling underlayment” which promotes conductivity. However, consumers should always check with the manufacturer to see if the floor is compatible with the system. Laminate– his floor, especially when floating, conducts radiant heating well. To be sure, check with the manufacturer. Best for Radiant Heat: It’s a tie! Best for Radiant Heat: Tie! Whatever you put into your home or business will directly affect how it appraises. Which floor is a better investment? This material has been making a lot of headway in recent years, but the stigma of its past still haunts it. If you pick a good quality floor, there’s a chance you can subtly raise your home’s value. However, lower-quality LVT/LVP can potentially hurt your home’s value. This material also doesn’t impress appraisers much. Though high-quality versions can slightly increase your property’s value, cheaper versions can negatively affect it. Linoleum is an economical flooring option that’s made of linseed oil, tree resin, cork dust, wood flour, ground limestone, and pigments, which are all pressed onto a jute fiber backing. It’s often considered interchangeable with sheet vinyl because they look similar, are affordable, water-resistant, and can mimic other natural materials like stone and wood. However, that’s where their similarities end. While linoleum has been around for over 150 years and is made of natural materials, vinyl has been in use since the 1940s and is made of 100% plastic. Laminate can resemble wood and stone like linoleum, but it comes in solid interlocking planks and is made almost entirely of wood products. It’s also not as water-resistant as linoleum or vinyl. Hardwoods are solid planks of wood harvested from trees. They’re 100% organic and must be kept safe from moisture and water damage. However, when well cared for, they can last for decades. Engineered wood has a thin top layer of finished hardwood called a veneer. This is then reinforced with multiple layers of pressed plywood and fiberboard— making it less susceptible to warping and water damage. Luxury vinyl looks like hardwoods but is made of PVC to be 100% waterproof. Though its durability rivals engineered wood, both hardwoods and engineered wood cost significantly more, look more natural, and give you a higher return on your investment. To find out all the differences between these three materials, please visit our guide to laminate vs. hardwood and our laminate vs. engineered wood guide. Looking for a Pro for Your Flooring Project? When you’re shopping for laminate floors, research some key features like their quality, reputation, and the warranty. 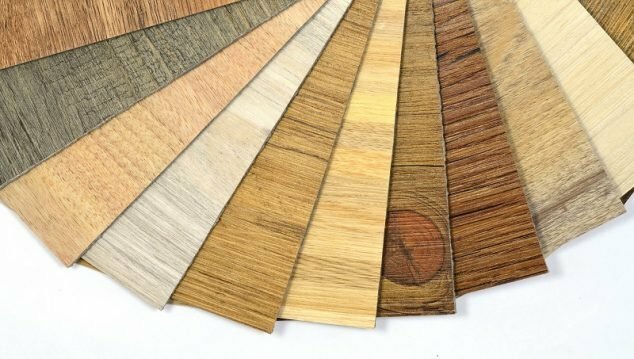 For a list of recommended brands, see our wood and laminate comparison guide. Homeowners should take care to select a brand that matches the quality of floor they desire that also suits their budget. The world of LVP is vast, with quality varying among manufacturers. Laminate Flooring vs. Hardwood – What’s the Difference & Which is Better? This article is dated. Modin (Flooret) has the best product with a 40 mill wear layer, Best in the industry. Rigid LVP is the wave of the future combining best attributes of both LVP and laminate. Modin Rigid has large planks, clicks together, has a 40 mil wear layer for about $4/SF. Handles like 1/4” plywood. What about noise levels? installing these in a wooden frame appartmenet buiding with some noise issues? which one is easier to insulate against noise? and which one is naturally better at reducing noise? Also there are new water proof laminate floording planks being sold that are also AC5. The sales person was telling me that these are as sturdy as Vinyl planks and are also water proof? I am getting estimates from your pros. My question is after I read your very good article I like to know what type of flooring is good for the bedroom with radiant heat. There is an unbelievable variety of floors. I like your opinion. Was advised we cannot use vinyl in non climatized building in AZ. We are snowbirds and do not use AC in summer months. Is this true for all vinyl? Thank you.